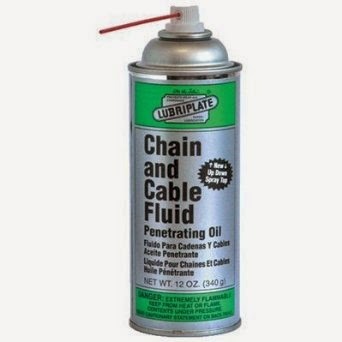 Lubriplate Chain & Cable Fluid Penetrating Oil is a petroleum based lubricant. Although this isn't specifically made just for garage doors it is one of the best lubricants I've used for servicing garage doors. I have used this lubricant for the past 20 for servicing garage doors and garage door openers and have not found a better lubricant. With the included straw for the nozzle it is easy to spray the lubricant into the tight areas. It's great for the garage door rollers, hinges, bearings, operator chains, sprockets, pulleys and most important the torsion springs. Spray the lubricant on the torsion springs once a year. This will help keep the spring from rusting and the coils of the spring moving smoothly. It won't leave a tacky film (like WD-40) and it won't dry out in a few weeks. I've also used it to lube the doors on a vehicle, hinges on the house door, lock cylinders, lawn mower, bicycle chains, and more. The list is endless. It is a very good all around lubricant. COMMENTS: Highly recommended. It could be a 5 star rating if the product can be purchased at a good price. It tends to be expensive but a 12 ounce can will last around the home for a long time. The blog is a part of our site GarageDoorZone.com. We often get asked a lot of garage door questions so it seemed logical to start a blog so we could present answers to the most commonly asked questions to our customers. We also wanted to be able to give insight into new products and solutions as they become available (and we find time to put them up here). Copyright @ 2008-2016 Garage Door Zone. Travel theme. Powered by Blogger.